As was the case at CES in January, I have some good news and some bad news about AXPONA 2017, held the third week of April in Chi-Town. The funny thing is that the good news and bad news changed places with the change in venue. Where the Venetian hotel (home to CES’ high-end audio exhibits) was a virtual ghost town with some forty fewer exhibitors than CES 2016, the Chicago show gained better than 40 exhibitors over last year, making for eight—count ’em—floors chockfull of hi-fi at the Westin O’Hare. Outside of Munich, I’m not sure I’ve been to an event with as many high-end audio systems—the vast majority in my price range (more on this in a moment). The bad news is that, unlike CES where for unknown reasons the sound was considerably better this year than in years past, the sound at the Westin was, with several notable exceptions, mediocre. To be honest, the sound has never been great at the Westin—or at the Doubletree before it. It’s just that this year there was so much more of it being pounded out in room after room it was like being trapped at a Dead concert during one of those endless Kreutzmann/Hart drum breaks. There is another piece of bad news—and another reversal of fortune. Where CES was so sparsely populated, I had no trouble visiting (and re-visiting) almost every room, AXPONA was so large and busy (and I was so preoccupied with book signings, panel discussions, and one extremely lengthy audition I got roped into that ate up the entire precious last hour of the final day of the show) I not only didn’t get to revisit any favorite rooms, I didn’t make it at all to a number of them. I’m truly sorry about this and extend my sincere regrets to the exhibitors I missed (and to readers for being unable to fully describe the products in several important rooms). In particular, I want to apologize to my friends Lars Kristensen of Raidho and Ansuz, Eric Pheils of Zanden, Phillip O’Hanlon of On a Higher Note, Art Manzano of Axiss Audio, Renee LaFlamme of Nagra, Garth Leerer of Musical Surroundings, the good folks at Amadeus, et al. for not being able to visit or return as promised. It wasn’t for want of trying, fellas; I just ran short and then out of time. Thus, this report is not going to be as complete as I would’ve liked. But, as I’ve said so often before, I’m just one guy with a briefcase full of blues, rock, and classical LPs, and the show (particularly this year’s AXPONA) was many. On the bottom floor, German Physiks was showing its $36.5k Borderland Mk. IV floorstander with GP’s remarkable DDD (Dicks Dipole Driver) omnidirectional bending-wave driver coupled to a conventional 12” woofer. 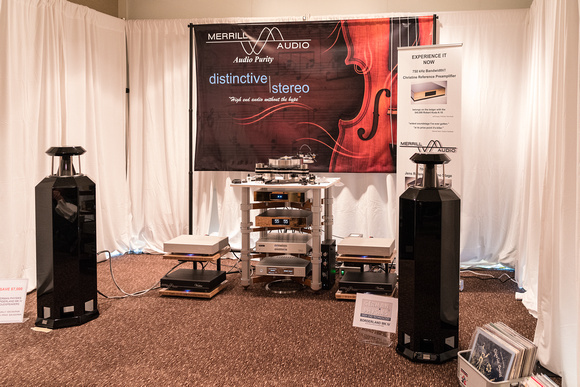 The Borderland was driven by Merrill Audio electronics (Veritas monoblocks, Christine Reference linestage, Jens phonostage), and sourced by a VPI Reference Avenger turntable, Aurender N10 server, EMM Labs DAc2X, and Studer 810 reel-to-reel tape deck, with all wiring from Merrill Audio. To put it plainly, the sound here was very damn good, with simply lovely timbre on a Bösendorfer grand, and an equally lovely sense of enveloping space. This was a better presentation than what I've heard in the past from GP, blessed with the seamless coherence of the DDD but with tighter imaging in the mids, terrific transient response and ambience retrieval in the treble, and very good integration and sock on the bottom. It wasn’t a direct-radiator sound but it wasn’t unfocused, bright, or ill defined, either. Terrific on Rimsky Korsakov and equally wonderful on Doctor John and Odetta’s version of “Brother Can You Spare a Dime,” this was my first Best of Show contender. I made a note that I should come back, but, of course, I didn’t. Also on the bottom floor in the Synergistic Research/Scott Walker Audio room, Ted Denney of Synergistic Research put on a Best of Show-contending exhibit of his UEF/Atmosphere room-treatment system using $38k Magico S5 MkII multiway floorstanders driven by Constellation Audio electronics (Centaur II amp and Pictor linestage), all hooked up with Synergistic’s Galileo UEF wiring, ’natch. The digital source was an Aurender N10 feeding a Berkeley Alpha DAC Reference Series 2 through a Berkeley Alpha USB. As was the case with the German Physiks room, this was the best demo of Synergistic Research’s remarkable room-tuning system I’ve heard (outside of my own home)—just wonderful reproduction of space, ambience, timbre, texture, and presence on a Willie Nelson and Johnny Cash duo and on a Walking on the Moon cut with drum, bass and sax. If you have a problem-child listening space, and you haven’t heard what Denney’s UEF/Atmosphere system is capable of, you really ought to. Still on the bottom floor, Jeremy Bryan of MBL was demo’ing one of my all-time favorite loudspeakers—the $70,500 MBL 101 E Mk II four-way omnis, bi-amped with MBL Noble Line electronics (N15 Class D monoblock amps and N11 stereo preamplifier) and sourced alternately by MBL’s N31 DAC/CD player and Greg Beron’s ab-fab United Home Audio Ultima2 reel-to-reel tape deck (which is simply the most musical 15ips reel-to-reel deck I’ve heard—and I’ve heard a few). On tracks like Sonny Boy Williamson’s “The Sky is Crying” and Jose Feliciano’s wonderful version of “I Was Born in Puerto Rico” from Paul Simon’s The Capeman, the MBL system produced what was—at that point—the most top-to-bottom balanced and natural sound at AXPONA, with a delicacy of detail that was slightly better than that of the wonderful GP omni, embedded-in-ambient-space imaging, and lifelike timbre and dynamics. 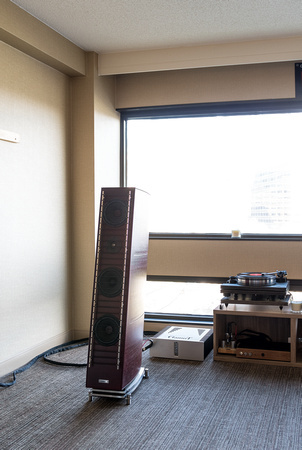 Up on the 12th floor, Musical Surroundings was showing the $70k Sonus faber Lilium three-and-a-halfway floorstander (with 28mm “arrow-point” tweeter, 180mm “natural fiber” midrange, a trio of 180mm foam/fiber-sandwich woofers, and a 260mm hard-paper-cone “infra-woofer,” all housed in a complex “Lyra”-shaped cabinet) driven by Pass Labs electronics (Xs 150 monooblock amplifiers, Xs Preamp linestage, Xs Phono phonostage) and sourced alternately by Berkeley Audio’s Alpha DAC Reference with Aurender N10 server on the digital side, and the Clearaudio Innovation and AMG 12 Turbo ’tables and ’arms (equipped with DS Audio DS Master1 optical and Clearaudio Titanium V2 mc cartridges) on the analog one. Even on first listen, this was a beguiling system—extremely rich and dark in timbre, fast on transients, and spacious in soundstaging. There was some room-induced bass boom (about which you will hear progressively more often, as it was epidemic at AXPONA), but not as much of it as I heard in other Westin O’Hare suites. The system had explosive transients on guitar and voice on “Texas Woman Blues” from my Taj Mahal LP, with just a little too much chest on Taj’s sultry baritone and a little extra sibilance (another problem you will hear more about) on the Pointer Sisters’ backup vocals. On the other hand, the Sonus/Pass system sounded less chesty and more realistic on “For All We Know” from my Johnny Hartman LP. So…pretty good in spite of the slight upper-midrange sibilance and lower-mid/power-range thickness. Also on 12, MartinLogan was showing its $25k Renaissance ESL 15A hybrid ’stat (curvilinear ESL panel mated to two, powered, forward-firing 12” woofers in a separate sealed enclosure) driven by Constellation Audio Revelation Series electronics (Taurus Stereo power amp, Pictor preamp, Andromeda phonostage) and sourced by Continuum Audio Labs’ Obsidian turntable and Viper tonearm (reviewed in this issue) with Ortofon A95 cartridge (expertly set up by Michael Trei). All wiring was from MIT. In the past I’ve had serious reservations about many of ML’s hybrids, which haven’t sounded all that coherent to me (see the Neolith below for an example). Not here, folks. 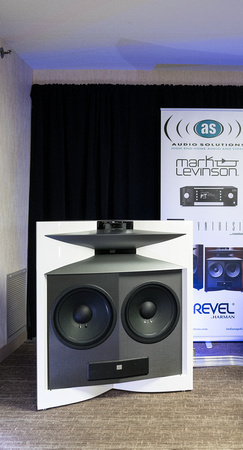 The ESL 15A was downright terrific—far and away the best sound I’d heard at AXPONA up to that point. Extremely natural on Taj Mahal’s vocals, not too thick in the power range (like the Liliums), not overly sibilant on the Pointer Sisters backup vocals, with well-defined, boomless, albeit somewhat limited-in-extension bass. I heard the same presentation on my Fine Young Cannibals LP—superb from bottom to top. The MLs might have been just a little less rich on Hammond organ than the Magicos S5s in the Synergistic room, but they had wonderful clarity and better than fair realism everywhere else. 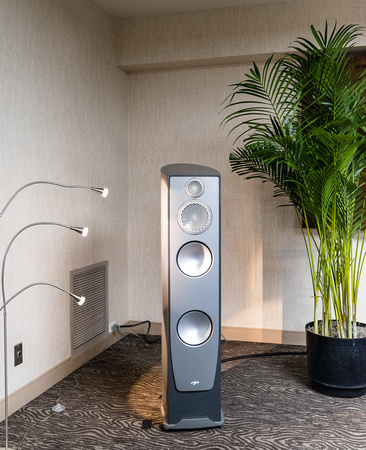 Moving down to the 6th floor, Aaudio was showing the $26.8k Wilson Benesch Discovery II two-way stand-mount coupled to WB’s $12.5k powered Torus sub. The Discoveries were being driven by Ypsilon electronics (Phaethon integrated amp, VPS-100 phonostage, MC26L step-up transformer) and sourced by Thales TTT Compact II turntable and Simplicity II tonearm with Ikeda KAI MC cartridge. All wiring was from Stage III. Next to the ML room, this was the most natural reproduction of Taj Mahal’s “Texas Woman Blues” I heard up to that point—neutral, highly resolved, sibilance free (on the Pointers), and lifelike. 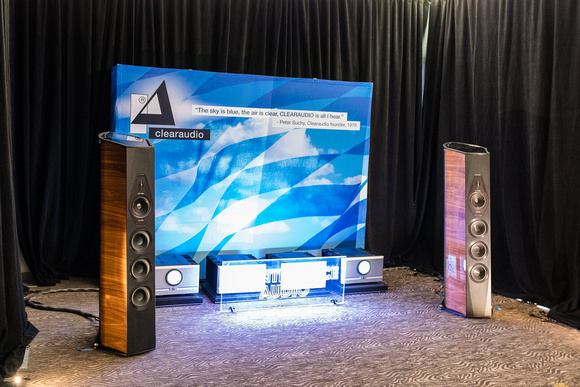 This was a great system with a superb disappearing act and a huge soundstage—very clean, zero box coloration, maybe just a little light in the power range and very slightly bright in the treble, but so transparent! 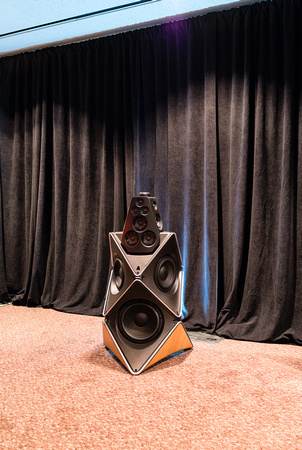 Elsewhere on 6, Magico’s $28k, three-way (1” diamond-coated beryllium tweeter, 6” nanographene-cone midrange, and two 9” nanographene-cone woofers) S3 Mk II floorstander was shown with CH Precision electronics (including the M1 monoblocks, L1 preamp, P1 phonostage) sourced by a Kronos turntable and custom reel-to-reel deck. The system sounded fabulous on a Jonathan Horwich tape of harp and piano (particularly on the harp—the piano was also good but a little blown-out in the power range) with extraordinarily lifelike transient response on sforzandos. Taj’s “Cakewalk Into Town” was downright superb—denser and more natural in timbre than I heard in the Wilson Benesch room without any loss of transparency, detail, or speed. The system was great on my Johnny Hartman LP, too, even though the S3’s had a little more top-end energy on piano than I love (I could also hear this a bit on trumpet). We move now to the 5th Floor, where Art Manzano of Axiss Audio was showing the $25k Piega Coax 711 aluminum-chassis, five-driver, three-way floorstander (with coaxial ribbon tweeter/midrange) driven by Soulution electronics (511 monoblock amplifier, 520 preamp, and 755 phono preamp) and sourced by a Transrotor turntable decked out with Air Tight’s extraordinary Opus 1 cartridge. The system was wired with Wireworld Platinum interconnects and Silver Eclipse cable. This was really quite the best I’ve heard Piega sound at any recent show—very smooth, detailed, warm (though not overly so) and natural in timbre, with wonderful air and ambience, to boot. On my Taj and Johnny Hartman LP, both baritones were as lifelike as I heard them sound virtually anywhere else at the show, with the added bonus on the Hartman disc of lovely sparkle on the piano (not a touch of the brightness that bugged me with the Magico S3), superb reproduction of harmonics, and great decay. On top of this, the standup bass was exceptionally well defined. Oh, there might have been a slight midrange recessiveness on voice and trumpet, but the system was so easy and lifelike I could’ve cared less. On the first floor, Von Schweikert Audio intro’d its gigantic thirteen-driver (two 15” powered subwoofers, four 9” ceramic mid/bass drivers, two 7” ceramic midranges, two beryllium tweeters, two 5” aluminum-ribbon super-tweeters), $295k Ultra 11 floorstander augmented with VSA’s Shockwave V12 subwoofers and driven by top-line VAC electronics (Statement 450 iQ monoblocks, Statement Line Stage, Statement Phono Stage) and sourced on the digital side by a Golden Gate Lampizator DAC with YFS Ref 3 server and on the analog side by a Kronos Pro ’table with ZYX Audio Ultimate 4D cartridge and a rebuilt J-Corder Technics 1520 reel-to-reel deck. All interconnects, power cords, and speaker cables were from MasterBuilt Audio. The system sounded the way it looked: big, powerful, utterly unflappable, granitic. In its soundstaging width, depth, and height, its image size and focus (which varied accordion-like from LP to LP, as it should have), and its large-scale dynamics—just superb on the famous Wilson recording of Debussy’s violin sonata—it was in a class of its own. In tone color it had just the right touch of natural warmth (courtesy of VAC). Superb on my Taj Mahal LP (best of show, actually, for realism), and very very good on Johnny Hartman, it exceeded the just-as-pricey Tidal system in sheer musical scale, but was not, I think, quite its equal in low-level resolution of timbre, texture, and dynamics, or bottom-octave grip and definition. I have a theory about why this might have been the case: It sounded to me as if the built-in subwoofers (augmented apparently by outboard subs) were being dialed in a bit too high in frequency, which may have slightly veiled the upper bass/lower midrange, robbing the system of some (not all, heaven knows) of the lithe transparency I’m sure it must have galore. 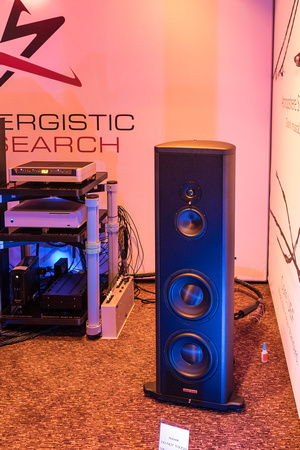 Having said this, there is no way that the VSA Ultra 11 was anything but a top-of-the-heap Best of Show contender—and a flat-out Best of Show winner in large-scale dynamics, soundstaging, and (on the Taj and Wilson discs particularly) sheer realism. Because of space limits I’m going to condense my comments on the other exhibits I heard at the show. B&O displayed its $85k Beolab 90, comprising 18 ScanSpeak drivers housed in a multi-faceted aluminum cabinet (made by an automobile engine-block manufacturer) with 8200W of built-in power per side and DSP room correction that in “narrow mode” (traditional two-channel listening) eliminates side reflections by phasing them out. Very spacious side to side but not front to back, the Beolab 90’s low bass was powerful but not at all well defined. The speaker was also somewhat bright and piercing at very loud levels with an exaggerated presence range. 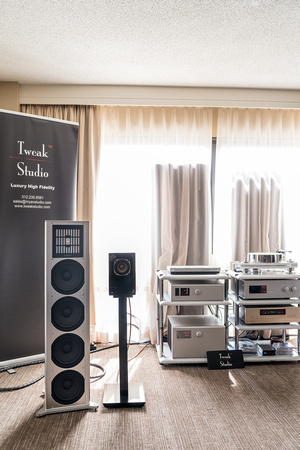 Philip O’Hanlon of On a Higher Note was showing the four-way, five-driver $58k Vivid Giya G1 Series II with Jadis electronics and a TechDAS Air Force turntable. Dark, rich, and forward-sounding, the Vivids didn’t develop much depth, plus the bass was overloading the smallish room. As a result of this plumminess, the sound lacked pace and definition. In addition to the Lilium, Sonus faber was showing its $45k three-way four-driver Il Cremonese driven by ARC electronics and sourced by AMG. The sound was very similar to that of the larger Sf speaker with just s little less chestiness and overripeness in the power range and bass (thanks to ARC). 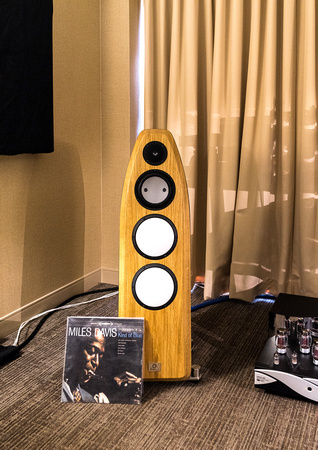 Marten showed its $80k Coltrane Tenor four-driver three-way floorstander driven by Zesto electronics and sourced by a Merrill Williams/Tri-Planar rig. Due to a bit of bass boom the sound was darker and less nimble than what I'm used to from Marten. Lovely timbre on trumpet and sax, nevertheless. The $97k Mother of Burl three-way horn system, which uses a vintage Altec woofer and midrange and JBL tweeter in a beautiful wooden horn-loaded cabinet, was being driven by Rogers electronics. On the Debussy violin sonata it had gorgeous string tone and lovely piano timbre (except for some slight megaphoning of the upper mids). Exceptional in dynamics, it would’ve been a contender had it not reproduced Johnny Hartman’s voice with a weird midrange phasiness. 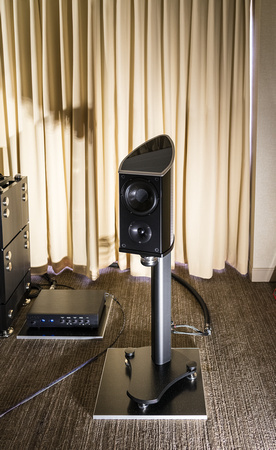 Acoustic Zen’s $22k three-way transmission-line Crescendo driven by Wyrd4Sound electronics suffered a bit from the bane of the Westin O’Hare—room-induced bass boom. Otherwise it was quite natural in the midrange and very realistic on voice. Once again, the AZ would have been a definite contender save for its bottom octave in this room (though to be fair the bass problems varied with source). The $26k KEF Blade 2 driven by Hegel electronics sounded a bit forward in the midrange, but otherwise warm and lovely in timbre. For some reason the Blade was not really imaging outside of its enclosures, which surprised me, and had zero stage depth (though images within the stage were round and dimensional). Still, its timbre was beautiful and its transient response extremely good. The $40k Tidal Piano Diacero two-and-a halfways driven by Bricasti electronics sounded dark, powerful, and beauteous like Tidals always do. The Gamut RS7i driven by Gamut electronics was quite neutral and majestic save for a little tubbiness in bass and a little vagueness of focus on voice. The delightfully weird $43k Volya three-ways (built to look like a giant woofer) were surprisingly open and fast and fun. 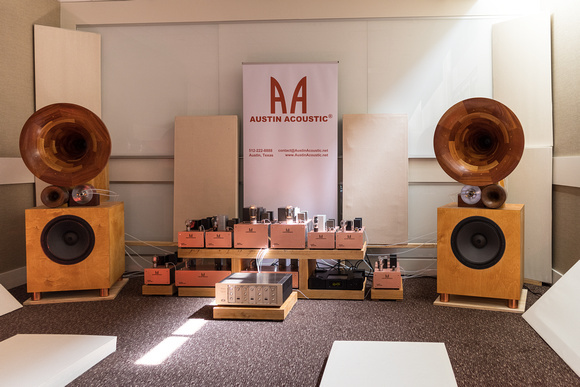 Austin Acoustics showed a prototype $550k horn system driven by Austin’s own electronics. In spite of incredible presence, speed, and dynamic range, it was a little too bright and piercing for me at moments (and I like horns). Still, this is a potentially great horn speaker offering a more direct connection to musicians than any other speaker I heard at the show—terrific immediacy despite its wear-you-down upper mids and not-very-deep or fully integrated bass. 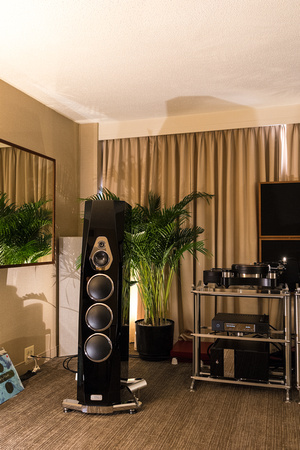 I finally got to hear the new $35k Paradigm Persona 9H (with beryllium tweeter and midrange) driven by an Anthem amplifier, and though I very much liked the speaker’s openness, resolution, speed, and neutrality, it sounded just a bit bright (the Westin again) in this room. It was also not generating much soundstage depth due to its near-wall placement. 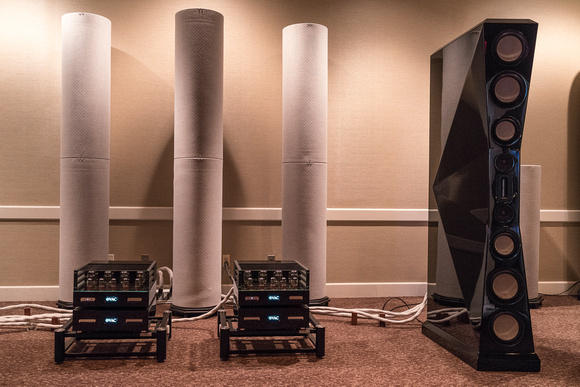 The less said about the $85k MartinLogan Neolith hybrid ’stat the better. Driven by McIntosh electronics it sounded very natural on voice and guitar but its cone bass was way overblown—ill-defined, boomy, and completely out-of-sync with its electrostatic mids and treble. . 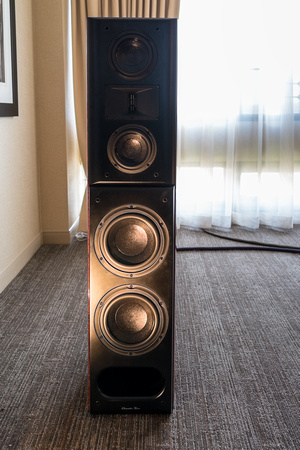 Finally, another old favorite, the horn-loaded $75k JBL Everest driven by Mark Levinson electronics, exhibited a bit of cupped hands coloration on Son House's voice but was nonetheless so alive I didn’t care. Man, horns can sound real (or not, depending on how they’re designed and built, what they’re driven by and sourced with, and where they play). Best of Show (cost-no-object): Tidal Akira with Tidal electronics and TW Acustic Raven AC-3 record player with Transfiguration Proteus D cartridge. 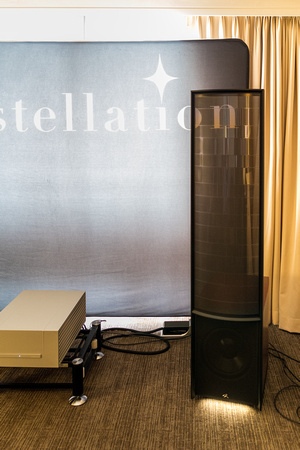 Best of Show (for the money): MartinLogan Renaissance ESL 15A with Constellation Audio Revelation Series electronics and Continuum Audio Labs Obsidian turntable and Viper tonearm with Ortofon A95 cartridge, all wired with MIT cables. Most Important Introduction: Von Schweikert Audio Ultra 11. Most Important Trend: Analog everywhere, both turntables and reel-to-reel decks. Most Coveted Product: Tidal Akira.